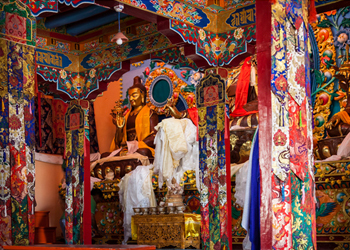 Takthok Monastery is situated in a small village called Sakti, which lies 46 Km east of Leh. Takthok means ‘rock-roof’ and the roof as well as walls of the monastery are made up of rocks. Takthok belongs to the Nying-ma-pa sect of Buddhism is also known as the “Old Order”. Fifty five lamas reside in this Monastery. The annual celebrations are held on the 9th and 10th day of the sixth month of the Tibetan calendar at Takthok Monastery. The main assembly hall called the Dukhang located on the right of the central courtyard has murals of deities painted on the walls of the verandah that are displayed only at the time of the annual festival. There is a throne inside the assembly hall reserved for the Dalai Lama and the wall left to the throne is painted with the sketch of Padmasambhava and paintings of Sakyamuni. Statues of Maitreya, the Buddha or Buddha of Compassion, idols of Padmasambhava and Dorje are in Dukhang. In Takthok Monastery, 108 volumes of Buddha’s teachings called the Kandshur are also there.